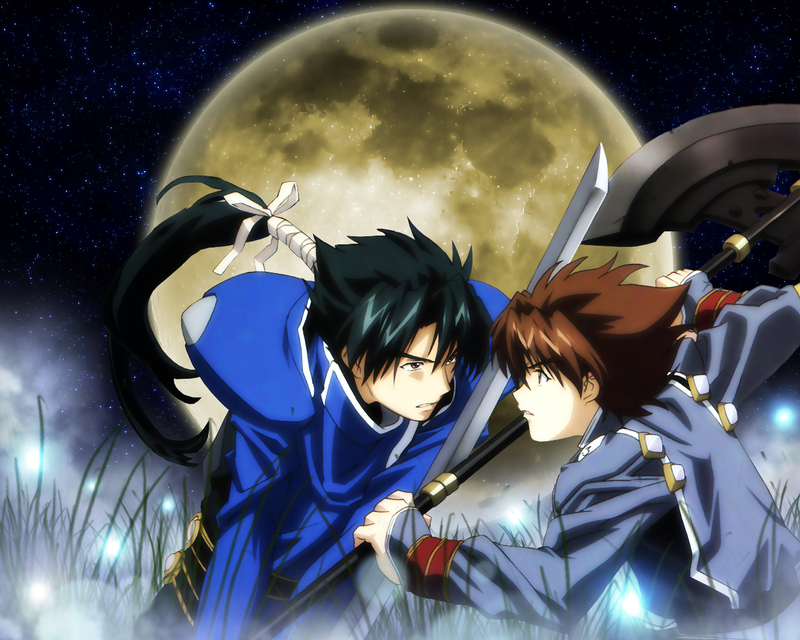 So I REALLY liked the Scrapped Princess series (which I watched back when it was first fansubbed) and ever since then I hardly ever see any good SP wallpapers (mainly because there isn't many scans). Anyway... I saw this scan (from nat on AnimePaper) and decided to do a Scrapped Princess wall. I kept it simple, featuring only Shannon and Chris against the backdrop of a moon. Awesome wall. The characters in front of a moon really gives that "anime fighting" moon :D Good job. merci beaucoup pour ce superbe wallpapers !! Very nice & cute wallpaper. The effect so great!!! Good Job ! Add to favorites!!!! i wuv the m00n .. *_* .. nd the blue stuff ^__^~ ..g00d job on this wallie~~ ^o^ +fav..
Scrapped Princess is such a GOOD anime omg. I love Shannon-nii he is so cute *cough* anyways erm..yea its a nice wall of him..he looks very handsome there ^.~ great job! wow..yah! i love sp also XD.....but there is limited walls for them =(..this is a awesome work!...please continue with ur aweomse work XD...need more sp yah!~!!! its so hard to find them..
but... shannon's pony tail.. looks abit... err.. I dun even know how to say it.. ^.^""
Anyway, the bg fits in perfectly with the scan~ awesome work!!! Thanks for such a great wall. Everyone's right. There definitely aren't enough good Scrapped Princess walls. Yours is definitely one of the best I've ever seen! i feel ur walls are greater than me..
the BG just great ..
ahhhh yes finally!!! a decent scrapped princess wall. I think the reason there are not too many scans out there might is because the girls in the anime...Although I loved the anime the none of the character designs really stood out. The image of "Scrapped Princess" was seen after a long time.....great work !! Never seen scrapped princess before, but looking at this wallpaper makes me curious about the anime XD.. i'm starting to feel like watching the whole serie lol! Anyway as for the wallpaper ^^, it just looks perfect like always. But ok that's what we can expect from a pro like you XD!